Cinder block walls can look drab and dreary, particularly in a dark basement or as a backdrop in a cozy bedroom. Installing tile over a cinder block wall can not only raise the aesthetic of the structure but also increase its water resistance and insulation capabilities. Spend time prepping a cinder block wall before placing the tiles on the surface to ensure a long-lasting and beautiful structure. First, the cinder or concrete masonry unit block needs to be prepared correctly. Any hairline structural cracks, sprawling or gaping fissures or chips should be addressed. Apply commercially made filler that is made specifically for cinder or concrete blocks to create a smooth surface to which the tile can adhere. Once the necessary repairs have been completed, clean the surface of the cinder block wall. The cinder block wall needs to be thoroughly scrubbed of dust from grout and chunks of loose brick so that the new tiles will be able to adhere easily and not fall from the wall or crack or crumble over time. When the concrete wall is plumb, tile can be applied directly to the surface or a metal lath can be fastened to the wall with a scratch and brown coat of mortar. This is best if the surface is somewhat uneven or marred. There are quite a few ways to prepare a block wall for tile, including direct mortar, cement board, Kerdi board and a layer of liquid membrane. Kerdi board building panels can be used to create a ready-made flat and plumb surface on the cinder block wall. They are screwed into the wall and are waterproof and thermally insulating. There are plenty of types of liquid membrane that can be applied to prepare a cinder block wall. Liquid membranes are thick layers of water-tight material that are laid or sprayed over a surface. They can be applied with a hand-pump sprayer for even coating, painted on for thick coats or rolled out in thick, pliable sheets. These can work really well to tile a basement wall. Direct mortar is mixed to a consistency that is like peanut butter and is applied directly onto the cinder block wall with a trowel. Mark the wall in the middle with a chalk line to create a guide for the tiles. With a notched trowel, apply the adhesive at the bottom of the cinder block wall. Apply just enough of the adhesive to attach a few tiles at a time so that the adhesive stays moist and ready to receive the tiles. Slowly make your way up the wall using cinder block spacers between each tile to ensure an even application. Make sure to use tile spacers along the floor and wall boundaries as well so that they stay firmly in place as you add tiles. Once the tiles have been placed on the wall, let the structure dry for 24 hours before smoothing grout into the crevices of the tiles. Besser blocks, also known as concrete blocks, are stacked in courses, which are layers with a half block to offset the course to create a stretcher bond. 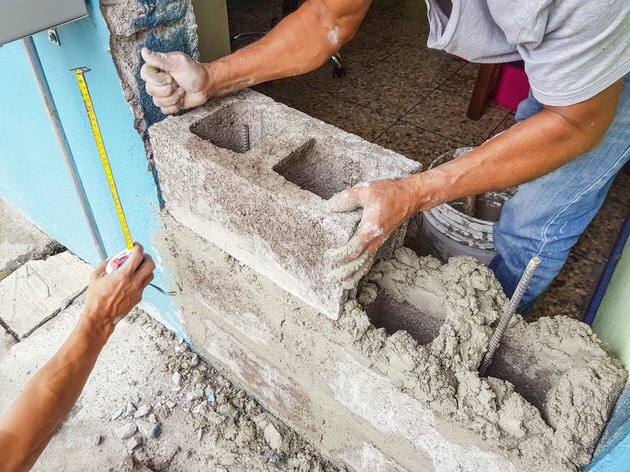 Cement mortar joints glue the individual blocks together for a sturdy union. Steel reinforcements are placed horizontally into the knockout blocks to strengthen the structure of the wall, while other blocks have steel rods placed vertically in the hollow cores. The vertical rods are used once the Besser block wall is tall enough to sway under its own weight.